Michael Berwanger is a classically trained licensed music educator and violinist who recently retired from the Baltimore County Public School system. 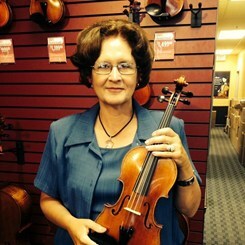 She has 32 years of experience teaching K-12 vocal and instrumental music students She has taught violin and viola privately for 45 years. She holds an advanced professional certificate as well as a Bachelor of Science degree from Towson University. Extensive training on the violin was achieved by instructors who were members of the Baltimore Symphony Orchestra or college professors at Peabody Preparatory, Peabody Conservatory of Music and Towson State University. During her musical career, she has organized and directed various musical performances featuring solos, small groups, ensembles, string orchestra, orchestra, and concert band.